The heading of a business letter contains the name of the enterprise, address, phone number, email number, and other information of the communication or sender at the top of the letter, which may be left or right justified or centered at the top of the pages. References number is written at the left portion of the letter in between the heading and the inside address. Recipient’s address includes the full address of the receiver or receiving organization to which the letter is directed. 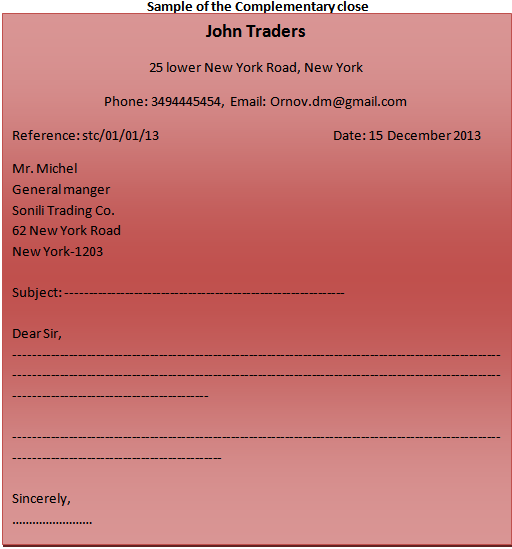 Write the complete name, title, and address of the recipient. Subject heading gives a brief indication of the contents of the letter. It is generally placed below the inside address. The salutation is under the subject headline. Mr. Mrs. Ms. Sir, Madam, Dear sir, Dear Madam, Dear Mr. X etc are used as a salutation. If you do not know the recipient’s name, it is fine to use the salutation, “To Whom it May Concern”. The most important part of the letter is the body which contains the message or information that the sender wants to convey. The body of the letter should be formally written. Business people are busy and do not have time to read long letters. In a one-page letter, it will usually only need three or four paragraphs, single spaced. Use a double space in between paragraphs. The closing paragraph should summarize what was previously stated throughout the letter. To close the letter, insert a phrase such as “sincerely” or “Thank you” or “Yours faithfully” or “Best regards”, “followed by a comma. The most common closing is “Sincerely. “Insert four lines between the closing and sender’s name. This space will be used for your signature once the letter is printed. Sign the name in the space above your name. To enclosing additional information with the letter such as a resume or curriculum vitae, Skip two single lines after your typed name and type “Enclosure” or “Enclosures.” If you the plural, you have the option of stating the number of enclosures. When any copy of the letter is sending to be distributed to another person, office or department is called ‘Copy Circulated’, Carbon copy’ or ‘Distribution list’. In this case ‘Copy forwarded to’ or ‘Copy’ title is used.